I have been reading books pretty much exclusively on my iPad Kindle app for quite some time now. I really enjoy having one single device for all of my evening reading and browsing. After I have read our real, live physical newspapers, that is. Most books are available for the Kindle at pretty much the same time as the hardcover shows up. That’s good. The Kindle price is generally lower than the hardcover price. That, too, is good. When the paperback comes out, however, the Kindle price does not go down. That’s not so good. To be sure, there are plenty of Kindle deals to be had. I subscribe to both the Early Bird Books and the Book Riot email lists, which offer deep discounts on selected titles. Indeed, I have enjoyed a few books that I have gotten via both at low prices. But if you are looking for a specific backlist title, and you expect a lower price because it is not a new, current title, you expectations may well not be met. For example, Barbara Tuchman’s acclaimed history of medieval Europe, A Distant Mirror, was first published in the 1980’s. The Kindle price is $13.99. True, the trade paperback at Amazon is $15.27, but still the Kindle price is more than one might have expected. I’m not really complaining. The publishing houses are having a tough enough time as it is staying in business. All of the consolidation is sad and depressing to see. They certainly have the right to ask a reasonable price for their backlist titles as well as for their bestsellers. And I’m grateful to have my iPad Kindle app and the opportunity to read such a wide array of books. The meme at the bottom of this post really spoke to me. I do get upset thinking about the Library of Alexandria. I was a classics major at Pitzer College. I studied Greek and Latin along with the history, literature, mythology, and art & archaeology of the classical world. In addition to all that we have, I think about all that we are missing. Take the tragedians, for example. We have seven plays by Aeschylus, but we have the names of sixty-eight others. We also have seven plays by Sophocles, but the names of another 116. We have nineteen surviving plays by Euripides but sixty-one other titles. Then there’s Aristotle. We have nothing of his own work, only what are in essence his students’ notes. There is a Homeric comedic epic poem called Margites which the Aristotle we have mentions, but for which we have no manuscript. Think of how many of these works we might have today had the library at Alexandria survived. 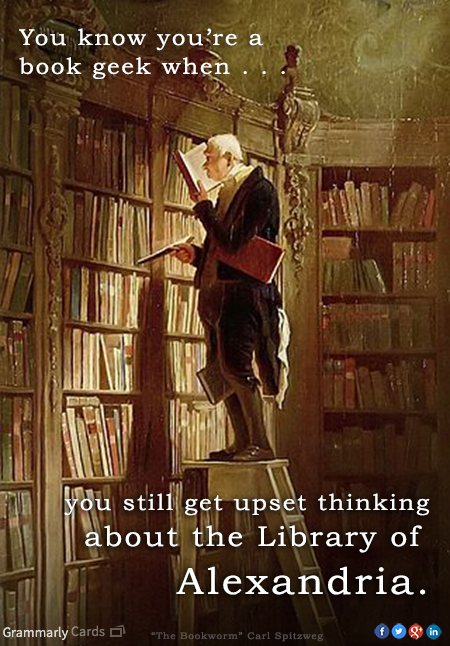 Yes, I get upset thinking about the Library of Alexandria. I have long planned on reading Jhumpa Lahiri, so I took advantage of this title being on sale through Book Riot to read her work for the first time. Unaccustomed Earth is a collection of stories, longer than short stories, but shorter than novellas. All of the stories are about Indian immigrants, specifically from the Bengali community, who have found their way to the United States. They are all involved in academia in some way, and most of them are in one way or another in the New England corridor, often in the Harvard/MIT orbit. The opening story, however, takes place in Seattle. Part One consists of five unrelated stories. Lahiri varies the voice from one story to the next. While one story is told by an omniscient narrator who knows the thoughts of her characters, another story is told by an omniscient narrator who is more removed. One of the stories is told from a first person perspective. Part Two is entitled “Hema and Kaushik.” This part of the book consists of three independent stories. Hema is the daughter of an Indian-American couple whose friends are the parents of their son Kaushik. The first story takes place when they are children, and is written in the first person with Hema speaking to Kaushik. The second takes place while Kaushik is in college, again in the first person with Kaushik addressing Hema. In the final story both are adults out in the world. It is written in the third person. The time frame is vaguely the late 1970’s and early 1980’s. There is talk of roommates sharing a corded telephone and a reference to The Empire Strikes Back being in theaters. There is a lot of back and forth travel between India and the United States. You would think that was a simple as the Amtrak trip from New Haven to New York City. As for happy endings? Not many. But Unaccustomed Earth offers fascinating insight into Bengali-American culture, and Lahiri’s prose in and of itself makes this book worth reading. Then I noticed something. People in the Four Seasons community were out walking when it was much cooler than sixty. I saw men and women much older than me out there when the temperature was in the low fifties. That got me back on track. I was in the grocery store the other day. I was not at our Southern California regional, union, privately owned chain. I was at our western states, non-union, employee-owned discount chain. I was in the produce section and I noticed a young Muslim women there with her young son, probably five or six years of age. We don’t have a large number of Muslims in Hemet, but we do have some. Enough to keep a small halal grocery store open here, something we didn’t have in Gilroy. The woman was nicely dressed, wearing a hijab and jeans. She was carefully selecting produce. Glancing at her cart, I saw it contained a wide variety of produce, and at that point nothing else. She was obviously taking a great deal of care with respect to her family’s health and nutrition. It occurred to me that most Muslims living in the United States just want what most people want. To be able to feed and care for their families. 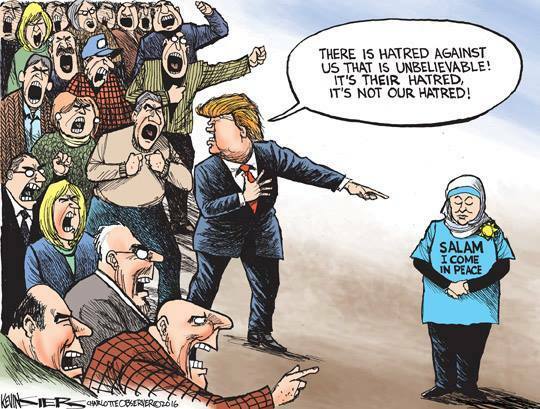 Yes, there are “radicalized” Muslims. And there are radical whites who occupy government property in Oregon. But most of us just want to live and enjoy our lives. That is worth remembering when we encounter people who are different from us. I’m trying hard to do so.